Through moments of sacrifice and also of joy, elderly Latinos find the courage to forge a new life in the United States. An elderly woman reads a poem from her newfound love. A little boy caresses his grandmother's tired face. Octogenarians study for their citizenship test. And a 98-year-old widow dances and prays for two more years of life. Charlene Music was born and raised in Costa Rica. After studying photography at Harvard she worked as a documentary filmmaker in India, where she produced domestic violence prevention films in collaboration with rural communities. In Costa Rica, she directed human rights films for organizations including the National Children's Hospital. Her film work has also taken her to China, Cuba, Africa and the United States. 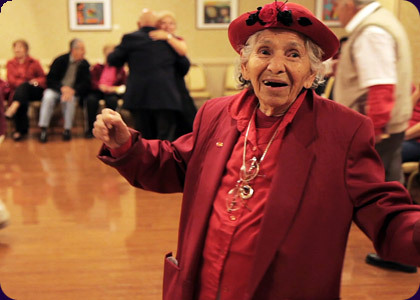 Charlene graduated from Stanford with an MFA in documentary film with her thesis The Old Immigrant's Dance, an intimate documentary about the challenges and opportunities facing elderly Latinos in the US. She is the recipient of awards from CINE, the University Film and Video Association, the National Academy of Television and Kodak. Charlene collaborates with international and humanitarian organizations to effect social change and empower communities through photography and film.